Anytime I watch a comedy, I simultaneously try to see the movie through the eyes of my younger self. Would little me like this? Would he laugh and quote the dialogue with friends? My reasoning is that, looking back, before tastes were acquired and maturity had set in, it was easy to love a lot of awful movies. Some hold up, however, and I’ve found those to be the films that balance their juvenile jokes with an equal amount of adult amusement. Having said that, I honestly tried to give Zoolander 2 that same lease for an extended shelf life. All for naught though, because this disaster piece ranks up there with the most unnecessary and second-rate comedy sequels that I have seen to date. Such a runway walk deserves a plank instead. Things begin with the collapse of “The Derek Zoolander Center For Kids Who Can’t Read Good And Wanna Learn To Do Other Stuff Good Too” where his wife dies. Eventually his son is taken by Child Services and Zoolander (Ben Stiller) goes into hiding. Meanwhile pop icons are being murdered, and Interpol agent Valentina (Penélope Cruz) believes only Derek and Hansel (Owen Wilson) can be the harebrained Hardy Boys to crack the case. The plot is about as fancy as an evening out at a cheap Chinese buffet and the poor taste in its execution meets only the lowest standards in the genre. To recount more than that opening would be to suggest that what follows is at all entertaining, purposeful, or scrapes the surface of funny. 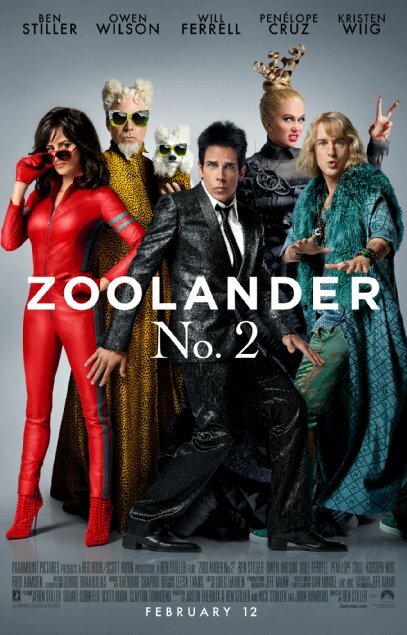 Zoolander 2 is anti-matter; a dull pencil that writes its story with the skill of a picture book. Simply, the movie seems to have been made without thought. It’s a loud tag-teamed frenzy full of foolish subplots here followed by a steely gaze there. The original might be a little cult hit nowadays, but it also underperformed at the box office by a large margin. So why more shtick from this feature-length excuse of a SNL skit? Maybe there is no answer. The film industry’s comedy landscape is teetering on the verge of collapse, suffering from its relationship with privileged and tired partnerships. What once was funny has now grown old, and just about every comedy released feels more like an excuse to get the gang together again rather than telling a smart, genuinely sharp story. From Adam Sandler’s crew to Will Ferrell’s unrestrained hullabaloo – just to name the major players – it’s apparent we’re paying to watch the conventions of a reunion party instead of the pep and pizzazz of an exciting first date. Boasting one of the most horrendous finales in recent memory, there’s really no point for me to go into any more detail about the story. It’s plain stupid. None of the action pieces are well directed. Many of the jokes from the first film are borrowed and faintly elaborated on. It reminded me, in the worst ways, a lot of Dumb and Dumber To. In each respective series, the characters start as numbskulls. But then they get older, and more cruel, and lose their ability to tell a mean-spirited joke whilst not actually being mean. The naiveté has vanished and is compounded with the overuse and reliance on celebrity cameos from Biebs to Willie Nelson to Susan Boyle to The Fat Jew (yes, he really makes an appearance). The movie ironically renders itself down to lard when its obsession targets tight jawlines and gaunt beauty pursuing the fountain of youth. The only positive thing I can say about Zoolander 2 is that it doesn’t run much past the typical 90 minute runtime. If it had, I would have happily checked out.